A zoned heating system allows greater control over heat distribution in the house. You can turn up the heat just where you need it, just when you need it—resulting in significant savings on your utility bills. Need some convincing? Read on to learn more about the benefits of zoned heating. Homeowners seeking a better way to control temperatures throughout the home should examine the benefits of a zoned heating system. A standard, non-zoned heating system controls the temperature of the entire house as a whole. A zoned heating system, in contrast, allows homeowners to control the temperature of each room or zone individually, thereby maximizing comfort and minimizing energy costs. A zoned system can be adjusted for numerous factors, including room usage, personal preferences, and environmental conditions. Zoned systems help homeowners use their heating systems more effectively by distributing heat where and when it is needed. O’Brian explains that a typical zoned heating system treats the main floor of a house as one heating zone and the upstairs bedroom area as a separate heating zone. This allows heat to be directed to the main floor during the daytime and to the upstairs bedrooms at night, allowing unoccupied areas of the home to cool down when vacant. A zoned system can also let homeowners minimize the heat in seldom-used areas, such as guest rooms or storage spaces. Zoning the heating system can save homeowners up to 30 percent on a typical heating and cooling bill, according to the U.S. Department of Energy. Because heating and cooling accounts for more than 40 percent of an average household’s utility costs, the savings from a zoned system can really add up. 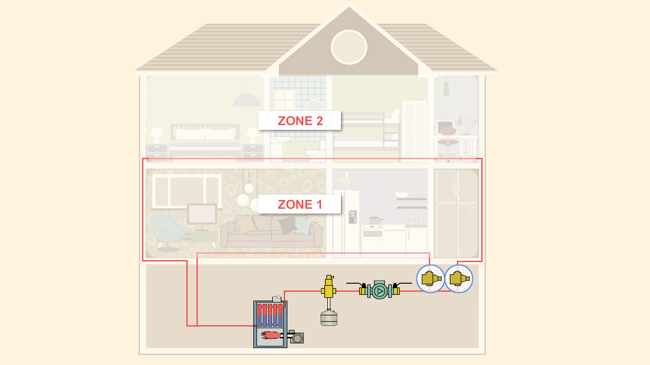 The basic component of a zoned heating system is a zone valve, which controls the flow of water in a hydronic heating system. Inside the valve, an actuator opens and closes the valve based on the thermostat setting for that zone. Zone valves are available in two- or three-way valve configurations and in various connection types. They can be normally closed or normally open and can provide differing flow rates depending on valve size, allowing homeowners to customize the system for different floor plans and different-size zones. Zone valves can be used with a wide range of hydronic heating systems, including baseboards, radiators, heat pumps, and radiant applications. Leading brands include Honeywell, Taco, White-Rodgers, and Erie. Homeowners with forced hot air heating systems also can create multiple zones by using two or more thermostats connected to a master control panel; the control panel opens and closes dampers that are installed within the ductwork. Even though installing a zoned heating system is not a typical do-it-yourself project, the energy savings and temperature control features may make it an extremely worthwhile home improvement. 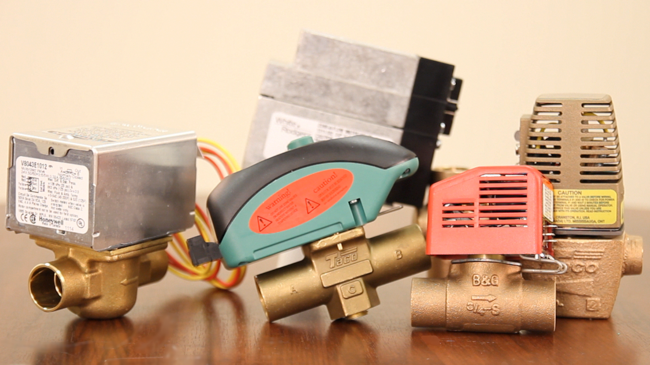 Online retailer SupplyHouse.com offers a large selection of thermostats, zone valves, and controls from the top manufacturers in the industry, and features a variety of information and instructional videos like this one, which explains how zone valves work.